Let's get back to business now that the obligatory 9-11 hangover has passed. President Obama and former President George W. Bush both visited Ground Zero to commemorate that faithful day of ten years ago. As always given the intensely polarized and partisan political moment that is the Age of Obama, the coincidence of "he who killed Bin Laden" and "he who made Bin Laden a low priority" meeting for the first time on hallowed ground has been fodder for both the pundits and the peanut gallery. To point: the above image is rich with semiotic possibilities where readers and observers can impose their own narratives and meanings--colored by ideology and standing political predispositions--onto the two leaders. 2. Do you smell what Barack is cooking? 4. A profile in courage? 5. It doesn't matter if they're black or white. "And I thought following the idiot from Texas would be easy...instead I get the Tea Party and the hard bigotry of high expectations..."
If you see the tape, when Barrack's head pivots down, George's pivots up. It's dynamic afro-physics in full effect! They seem to be facing the place they'll be going after they die. My beloved friend Mr DeVega. 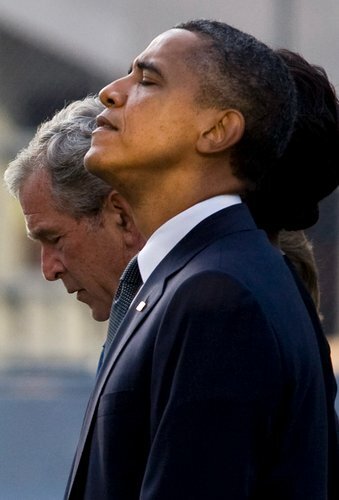 1) Obama says to Bush - "I showed you how it is done son! While Blacks attacked you for Iraq - I was a more efficient imperialist in Libya and was able to compel the 'Anti-War Left' into silence least they assist a Republican just like you to come into power. In 2012 I am going to scare Black people into voting for me by saying that Perry/Bachmann might bomb Africa because they are racists." 2) Bush says to Obama - "I should have focused upon killing Africans rather than Iraqi people. After shooting 3 Somali Pirates to rescue a White American ship's captain, shooting an unarmed man of color in the head and have it not labeled as torture and then conspiring to run 17,000 bombing sorties in an African nation the Blacks call ME racist!!!". 3) Bush to Obama: "Black unemployment at 16.7% after 3 years of your term and they still blame ME for their condition. How are you going to manage keeping the Blacks and the Hispanics happy in your second term with these numbers?" 4) Obama to Bush - "THANK YOU for the Tea Party. They are the ticket to my next election. Without them my base would have to focus on ME and force me to define what "Hope and Change" had bought them"
There is no copyright on any of these posts. @Chris Sharp. Bigotry? High expectations? What you talking about! @Nomad. You need to stop. You gonna make me laugh and cry. @OC. Astro-physics. As in "afro" and "physics?" That is pretty good. @Constructive. Brother you need a copy editor. A caption, done gone and written a bunch of copy. Slow down. I was hoping you would call in to harass me over the weekend. What happened? It is often observed, whether correctly or not, that there was a very intense change in the way privacy, states secrets, and general executive branch bullying was allowed after 9/11. That day is of course seen as the validation for it all.